This barge is a flat decked rectangular work barge of all welded steel construction with raked slope plating at the stem and stern with rounded corners and stern logs. Parallel straight sides are flat sided, of all welded steel construction with flat bottom and deck plates. The decks are without sheer or camber. The barge is configured into 6 internal compartments with a full width forward and aft rake sections with four centerline tanks divided by a center line longitudinal bulkhead and 3 watertight transverse bulkheads. Tanks are accessible by 18" flush deck single, bolt-down dogging scuttles (moderately watertight) with steel access ladders missing in many of the tanks. The maindeck features 8" double bitts (with horns) on every corner fore and aft with a pair of 1 1/4" towing padeyes forward. A single 6" bitt (with horn) is on the centerline forward. Two 36" cleats (two per side) are fitted along the sides. There is no fendering system installed, but the hull has a single 1" x 6" flatbar rub rail fitted below the deckline. 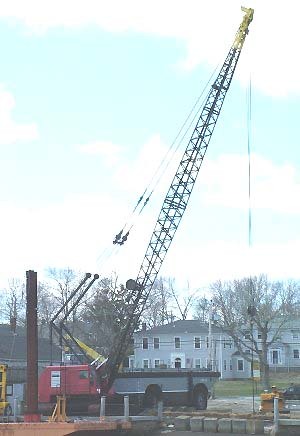 An I-beam boom crutch is fitted on the centerline forward. An 8' x 10' container box with opening doors is laid on deck on the port bow and is utilized for light deck storage use. The center area of the maindeck running fore and aft is covered with heavy oak matting in various material condition (fair to good mostly); this matting is well contained by a steel I-beam around the perimeter. There are two 1" x 22" x 22" x 50' steel H-spuds with 1" steel wire straps provided for lifting; these are in good condition; both are situated on the port side and are within their 1" x 28" x 28" spud wells fine.